Economy Personalized Paper Fans in Bulk, Glued, Inexpensive. Promotional, with up to Full Color Imprint. Budget Prices in USA and Canada. 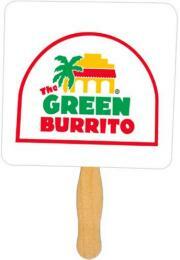 Cheap hand paper fans, custom imprinted in up to full color (your color photo or unlimited number of imprint colors). Our inexpensive promotional hand fans are ideal for Political Campaign, Rally, Celebration, Church, Wedding, Club, College, Concert, Convention, Mardi Gras, Trade Show, etc. They come with glued wood handles and may be imprinted in up to full color on one or both sides (see the price table). Many shapes of our economy fans are available at the same price: Fan Shape: Square with Rounded Corners, Round, House, Octagon (Stop Sign), Heart, Football Helmet, Ribbon, Hour Glass, Seashell, Bread Slice. 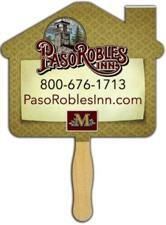 Budget Prices in the USA and Canada for custom full color hand fans in bulk. American clients don't pay taxes. We will send you a proof for your approval before production. Contact us for pricing of larger quantities. Please also check our hand fans with stock images: church-religious fans, wedding fans, birthday fans, party fans, etc. Fan Shapes: Square with Rounded Corners, Heart, Round, House, Octagon (Stop Sign), Ribbon, Hour Glass, Seashell, Football Helmet, Bread Slice, Number 1 Finger, Mini Round Fan (6 in. diameter): same price. Material: 16 point board stock. Typical Production Time: 5 days after artwork approval; 3-day Rush production is available: add $0.30 per fan.